The price of SSD’s have fallen dramatically in recent years and as costs have dropped, the popularity them has increased exponentially. At one time an SSD was a rare treat for serious PC enthusiasts but now they are cheaper and more readily available than ever. No other single solution is as cost-effective and impressively effective as swapping out an old hard drive in favour of the faster and more modern SSD. The hard disk drive (HDD) is a technology that dates back as far as the 1950s and they became the default solution in all PC’s for decades to come. Most old laptop and desktop machines still contain their original and worn hard drives they came with when purchased. The HDD was a mostly mechanical device. Inside a metal outer casing was a series of spinning disks arranged in a delicate stack known as a platter. Each drive reads and saves data by using a tiny needle moving across the individual disk’s surface. The technology looks and works much like a miniature record player and just like a record player the hard drive has some serious drawbacks in their usage. An SSD simply makes the process of retrieving and saving data much, much faster. Eliminating the mechanical component and the physical disk means a much faster and smoother operation when reading and writing data. Computer startup (where the operating system loads all its data from storage), can be 2 to 4 times quicker with a SSD when compared to a HDD. Also the loading of applications and data from an SSD takes a fraction of time of an HDD. An SSD completely breathes speed and thus new life into an old machine. Computers with an SSD replacement can feel like using an entirely new machine for a fraction of the cost. For laptops a SSD makes even more sense as they require less power than older hard drives and thus make the battery last longer than using a standard HDD. Their size and weight also makes the laptop slightly lighter. With no moving parts SSD’s run almost silently too. Many people comment on the noise their laptop used to make starting up and loading programs with the familiar click clack of the old drives. Noisy laptops are a tech throwback we’re happy to leave behind. For many people the cost of a new computer can be prohibitive. 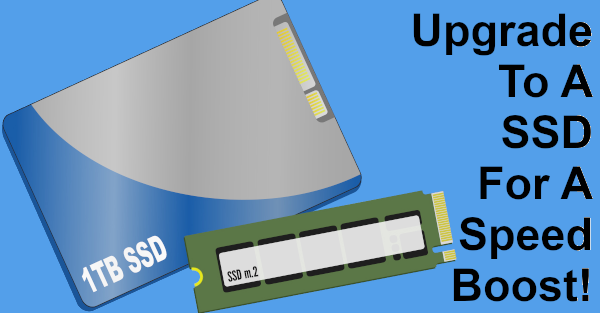 A simple SSD upgrade can make your old machine new again at a much smaller price and keep all your data and applications. If having a quick startup with fast response when loading applications sounds right for you then consider upgrading to an SSD as you won’t look back. If you are in Adelaide, South Australia and are looking to upgrade to a SSD then contact us now and we can give your old PC or laptop a new lease on life. This entry was posted in Hardware, Tips & Tricks and tagged adelaide, hard disk drive, hdd, slow, slow boot, slow computer, solid state drive, south australia, speed up, ssd, upgrade, why is my computer slow by David Perkovic. Bookmark the permalink.